RED SKY DESIGNS, INC - Red Sky Designs, Inc.
​New and IMPROVED website coming SOON ! CLICK BELOW TO CHECK IT OUT !! We'll be adding a LOT more to our NEW website including more of our bison leather and cowhide beer bottle and can holders, leather handbags, bracelets, leather earrings and our custom laser engraving for weddings, promotional and corporate events. Red Sky Designs was started in 2010 and has grown to become the full-time career for Montana natives, Tim and Lori. 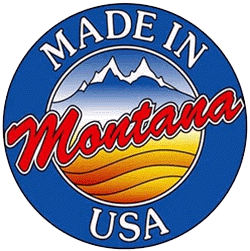 As a husband and wife team of 33 years we equally contribute to and share in the artistic and technical elements of the design and manufacturing of our high quality, official Made in Montana products. All of our original designs are handcrafted by the two of us in our smoke free Montana shop from bison leather, hair on cowhide and smooth leather. We have our own laser so we LOVE custom orders and we specialize in customizing many of our leather products for weddings, corporate gatherings and company or ​promotional events. Our designs include plain or custom leather laser engraved beverage holders for beer bottles, cans, micro brew pints, tall boys, slim cans - Michelob Ultra, water bottles and wine bottles We handcraft leather clutches and cross body handbags, leather earrings, bracelets, cuffs, chokers, necklaces and tassel key chains and more. We typically ship in 2-5 business days but let us know if you have a tight deadline and we'll do what we can to meet your time frames. We guarantee your 100% satisfaction with our products - For wholesale or volume discounts, special requests, large custom orders, special personalized items or for production and shipping time frames, please email us at Lori@RedSkyDesigns.com. Bought two personalized can holders and both recipients LOVED their personalized gifts. Fast and friendly service with great quality products! I strongly recommend this company and their creative work. Fast shipping as well! I bought my first one off Etsy, my favorite coozie ever, thank you. This is for my wife so something more "girly" if possible I ordered 1 last year for myself and it is by far the best koozie I have ever owned the quality is outstanding it's survived ski trips countless days in the lake floating with me and so on. Thank you for such a awesome product"